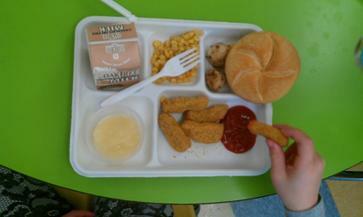 Chicken Nuggets are an extremely popular lunch choice at our school. This is going to be a very chicken-y week. 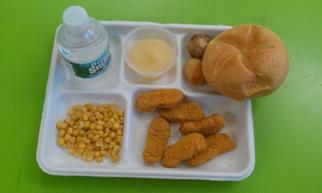 Monday the lunch “A” option is chicken nuggets, and the “B” lunch for the week is a breaded chicken patty on a bun. There will be one more chicken entrée Thursday, as well. On any given day about a third of the students at our school opt to receive the school lunch. The rest of the students bring a lunch from home to the cafeteria. On the first day of the school week (usually Monday, unless there is a school holiday) the “A” lunch is always chicken nuggets, and on the last day of the week (Friday) the cafeteria always serves a variation of pizza. There tends to be a higher number of children buying lunch on those two days. Sunflower also ate her corn, and drank her chocolate milk. She did not eat the roll, and she didn’t comment on it. Zee- “My stomach hurts today. [Zee had some sort of mishap or misunderstanding involving the playground, rules, and appropriate first grade behavior. As a result he was very upset when he first came in to lunch. He eventually regained his appetite and was able to tell me about lunch.] I like chicken nuggets. At home I like to eat barbeque chicken. I don’t like the corn here because I only like corn still on the oval [cob]. I’m not hungry for the bread. And, I only eat potatoes that are french-fries. Health: 6/10 (Ms. El pointed out that their trays were not very colorful today, so they knocked off a few points). Recess: We played outside on the playground equipment for recess. That’s my favorite recess (Sunflower). I love how the kids rationalize what is healthy and what is not :) I need to go home and question my son today. He is not as old as these kids, but I am curious if he picked up anything from all my talks! I do have a question for Ms El. - it looks like both kids did not eat their potato and bread. Does that food go in the trash? It seems like a waste for the kids to be served food they won't eat anyways. Do they pick items themselves or does someone serve them? Ms. El, Honest question, what did you think of Jamie Olivers campaign for school dinners in the good ole USA? “Chicken nuggets are healthy because they are made of chicken and chicken is good for you." OMG! I can only hope there will be somebody close to this kid to explain that those Chicken Nuggets are made from leftover chicken meat, pressed into shape, then fitted with a less than healthy crust. And to make things worse, they are usually deep fried. Or at least pre-fried, then cooked in the oven. "I like all healthy things." "I don’t like the corn here because I only like corn still on the oval [cob]." "And, I only eat potatoes that are french-fries." Should I comment that? No, I don't think so..
"Health: 6/10 (Ms. El pointed out that their trays were not very colorful today, so they knocked off a few points)." So "multicoloured food = healthy"? Interesting theory. Fits right into the "pizza = vegetable" part.. So a pizza with some red and green peppers, yellow cheese and off-white bottom is a healthy vegetable? Why does it seem that from all these guest-bloggers those from Asia not only seem to really know what healthy food is, but also seem to enjoy eating it, while the kids from the western regions seem to think that all that trash they eat is healthy? Are parents in the western world that stupid, that they can't educate their children about healthy food? Or is it just because all meals have to be prepared as fast as possible, using all those convenience food products instead of doing it right? No wonder, there's so much more food allergies in the western world than in asia then.. It's not that parents are stupid, most haven't been taught proper nutrition themselves. Also many people who grew up eating lots of unhealthy food are used to it, like it, and continue to eat it. 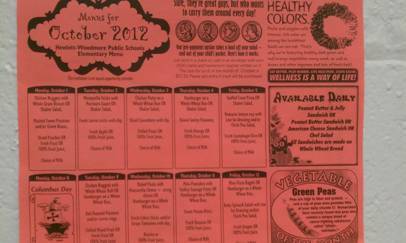 Some schools in the US have started to make school food healthier. The schools in my district always offer a large salad bar which includes lots of fresh veggies as well as pre prepaired salads (one I like is a black bean, corn, tomato, and cilantro one), at least one kind of fruit, a cooked veggie (changes every day), and a main entree (stir-fried chicken and brown rice, veggie lasagna, etc.) Granted there are occasionally things that aren't great: turkey hot dogs, hamburgers, chicken nuggets, but it's a work in progress. The schools here also have stopped serving french fries and all breads are whole grain. The district I work in is not wealthy, it's inner city and most kids in my school are in a free or reduced lunch program. The food served at school is probably better than the food the kids get at home. Also they get a fresh fruit or veggie snack every day in our district. It's an awesome program that was just started last year. appropriate nutrition. Both foods being filled with sugar, salt and other additives, I could not call them healthy in any circumstance. Do you think the children in your class would recognize real chicken meat? Would they like the taste without the breading, sauce etc? Wow, nugget is a healthy food. the kids' honesty greatly amused me. i too like chicken nuggets! ms. el sounds like a nice teacher. question: do the children have an option for some sort of spread to put on their bun? i can imagine hundreds of buns being thrown out at the end of the day because it seems like the most boring part of the lunch. The chicken used in nuggets usually comes from "factory farm" chickens, who are crowded into long houses with no daylight and fed lots of antibiotics (because overcrowding makes them sick a lot) and even additives like arsenic to make them grow faster. The nuggets aren't cuts of meat, they're leftover bits of the chicken, ground up and put through a sieve. Then they add lots artificial flavors, colors, and often preservatives. The "nuggets" get breaded (more chemical additives) and frozen before being delivered to schools. There are some better versions of nuggets out there but most are just not healthy, even if you like the taste. While I'm certainly not going to try to convince anyone that processed chicken nuggets are anywhere close to optimum nutrition, what I think perhaps people are losing sight of here is cost. Public schools in the USA receive money from government sources (local, state and federal)to provide meals. They also do charge a nominal fee for lunches, but it's not at all uncommon for one-third to one-half of the students in any particular school to be eligible for free or reduced-price meals. So they must budget their meals tightly. If money was no object, I'm sure a lot of schools would offer students much healthier options. When Jamie Oliver goes to schools in the US, attempting to convince school officials to make lunches healthier, he's also having to attempt to convince school boards to spend a bit more money on lunches. And the question always arises: Is there someplace we can cut down in order to have the increased money for lunches? Due to those bugetary constraints, many schools have found that it's cheaper to just "contract out" lunches. Which is why so many kids here in the US get what look like "TV dinners" which have been slightly warmed up in large microwave ovens. Cooking meals on-site is much more expensive but, at least that way, the school has a bit more control over what is served. For many school districts, it's basically a no-win situation. So I'm at least happy to see that the Long Island school prepares their meals on-site. And then, of course, you've got to strike a balance somehow between what is good for the kids vs what they will actually eat. It doesn't really do anyone any good if the kids toss most of their lunch in the rubbish bin. Of course, we all know that you must expose kids to new foods if you want them to learn to like them, but that is perhaps best done gradually. I just wanted to let everyone know that I am not guiding the childrens' responses for the most part (I know, I said something about the health rating, but they were pushing for a 10/10 so we had a short discussion about colorful fruits and veg). 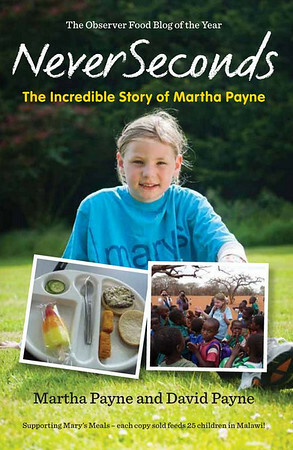 I was mostly curious about how a six year old perceives the meals they are served, and what they understand at such a young age about about health and nutrition. That being said,here are your answers. Yes, everything they don't eat is tossed out. NY State does not allow food that has already been served out to be recollected and served again. I think that is a fabulous rule, you should see the stuff that comes out of these kids noses. They can request that certain food items not be placed on their trays, but usually they passively take everything. I'm not sure why that is. I think Jaime Oliver is great. I don't think parents in the Western World are "that stupid," keep in mind not every parent has the means to make their child a lunch every day. Preparing lunch for a 6 year old takes time, money and the 6 year old's cooperation (plenty of home prepared beautiful lunches are tossed every day.) School lunch requirements are set by the Federal government, and the vendors districts are allowed to buy from are also prescribed by non-educator officials. More on that in a later post. Zee and Sunflower both had chicken prepared from regular unprocessed raw chicken last week at home for dinner. I asked. And, have you ever had completely unseasoned chicken? It's not very appealing. I like chicken nuggets too. But, I like to make them myself using chicken breasts, my own seasoning, and I bake them. Even better than Wendy's! There is no spread for the rolls, but that's a great suggestion. Tomorrow we have no school! Hurricane day on the East Coast. There should be a post up prepared last week. But, I hope everyone stays safe and has a delicious home lunch. Yikes, I knew chicken nuggets weren't healthy and I knew of Jamie Oliver's distaste for nuggets being served in schools, but I didn't know about the antibiotics and arsenic they feed to chickens. That NY Times article that Cyndi posted has greatly disturbed me. Thanks for the eye-openers in the comments here. My first thought when I read these comments about chicken nuggets, French fires etc was that some older kids were being ironic and trying to wind people up then remembered that Americans are said not to "do irony". I have to say the one commenter was very rude and a little overbearing for children. It was not neccessary to critique every word these children said. I have to ask...what is the redish stuff that Sunflower is dipping her nugget into? I'm guessing ketchup? My daughter's school offers ketchup for nuggets, and we're also from the US...so its what I'm going to guess. Its true. Nuggets are not considered healthy, unless its whole pieces of chicken...and that's not what schools get. The corn however, is considered rather healthy, and actually they have had articles stating that corn in a can is just as healthy as on the cob...but I can understand Zee's joy of eating off the cob. I remember being a kid and loving the taste of the corn popping into my mouth when I bit it off the cob. Apple sauce is super yummy too. Have the children tried dipping their nuggets into the apple sauce?? I have to admit I have a guilty pleasure of doing that from time to time. Tis so tasty that way. Sounds like these kids are having some great talks about whats healthy and what's not healthy. They might be a little off on some of their healthy decisions, but lets face it...most little kids are. Thanks for sharing in the blog! Its nice to see some fellow americans posting from time to time. Don't worry about that commenter. He/she is critical on almost every blog post on here. I think he/she should worry about what they are eating rather than what these kids are eating. But that may just be me... :) Love your comment, btw! Ms El, thanks for answering my question! I hope that someday the kids are taught to pick/ask for only what they want and plan to eat. That way food will not be wasted. The school could even donate leftover food to food banks if they are going stale. Oh my God, I knew American school dinners are bad, but this really prooves it, even the kids think they are eating healthily! And while some people are 'making up' for feeding this crap for their kids because 'it's cheaper'... Well hello! Just in this blog we've seen multiple countries with schools that have manufactured food in laaarge countities but it is nothing like this! America should just get over their "we are great we don't have to learn from anybody" and make some research over the school lunches on other countries! Here we have seen meals from all over the world, what about the Finnish students? If I recall correctly they had their lunch for free and there were no french fries in sight... Gosh this gets me so aggravated seeing kids eating like this! Even the strawberry and chocolate milks are totally unnecessary. As if the kids couldn't drink just plain old milk, without all the colourings and sugar? Laura, to be fair, I think most school administrators know their school's lunches aren't real healthy, even if the kids may not. And while I can't speak for all Americans, I know that I, myself, don't think "we are great we don't have to learn from anybody." A large part of the problem is a basic difference in idiology. Most Scandanavian countries (including Finland) have a much higher tax rate and people are okay with paying that much in taxes because they expect their government to provide many more services in return (health care for all, subsidized day-care for working parents, free school lunches, etc.). In the United States, there is a large (and still growing) movement towards the idea that our taxes are already far too high and we have too much government. They see most government services as "socialism" and find that a very offensive word. Some would like to eliminate school-lunches altogether, as they feel it is the parent's responsiblity to pack lunches for their children each day. To be honest, they do have a point. If parents aren't satisfied with the nutrition in the children's school lunches, parents always have the option to send a lunch to school with their kids. Unfortunately, with the reduced-price and free meal subsidy, that school lunch may be the healthiest meal some kids get all day. Remember, our economy is in shambles right now. Our unemployment rate is still quite high (meaning many parents don't even have a job) and there are fewer people earning money and therefore paying taxes as a result. So most government services are seeing budget cuts, not increases. So it's not that we don't know these lunches leave much to be desired. But, as I said, given their limited budget, schools are rather between a rock and a hard place. They'd like to serve more nutritious meals, but the money just isn't there. And, people aren't willing to have their taxes increased. They're already struggling to make ends meet as it is. Chicken nuggets were always my favorite school lunch. I liked the green beans best - not so much the corn. We usually were served corn bread or johnny cake bread. Mmm, this brings back memories. Not bad this school lunch... Really, you ca't eat every day fried meal but... sometimes... I LOVE chicken nuggest! chicken nuggets are healthy. wow. no wonder why obesity is rampant in the usa. i don't agree that most of the replies here are so defensive of trash food and blaming of the bad economy because the health risks that come with obesity in the long run (heart disease, stroke, type 2 diabetes etc) are bound to incur even bigger medical bills. it's simple logic, really. healthy food doesn't have to be expensive. no one's saying that it's absolutely necessary for parents to buy organic stuff for their kids. take some of the lunches here for example. carrot sticks with a SMALL amount of dip are a good start. there's also nothing wrong with parents packing leftovers from a healthy home-cooked dinner for the next day's lunch. the keyword here is to plan ahead. you can always prepare more pasta or rice for dinner and heat up leftovers for packed lunches. my god, this lunch actually looks like what martha's school food was like when she first started this blog! good nuggets and good to have along with evening tea!! !